Entertainer of the Year for 1979 – Willie Nelson. In case you’ve never read it, this is a reprint of a great article that was originally written by Michael Bane following Willie Nelson’s win of the highest award in country music. In 1979 the Country Music Association ratified what everybody already knew: Willie Hugh Nelson was named Entertainer of the Year, the highest award country music can give. Willie Nelson accepting Country Music’s biggest award in 1979 – CMA “Entertainer of the Year”. After sitting through the entire awards show and watching Kenny Rogers grab every award in sight, Willie figured he was off the hook. “I thought Kenny was about to clean sweep,” Willie says. “So I was surprised. I was shocked.” He was wearing his usual jeans and a neat cowboy shirt, his long hair pulled back in braids. He took the microphone and thanked the audience modestly, started to turn away, then turned back to the audience. 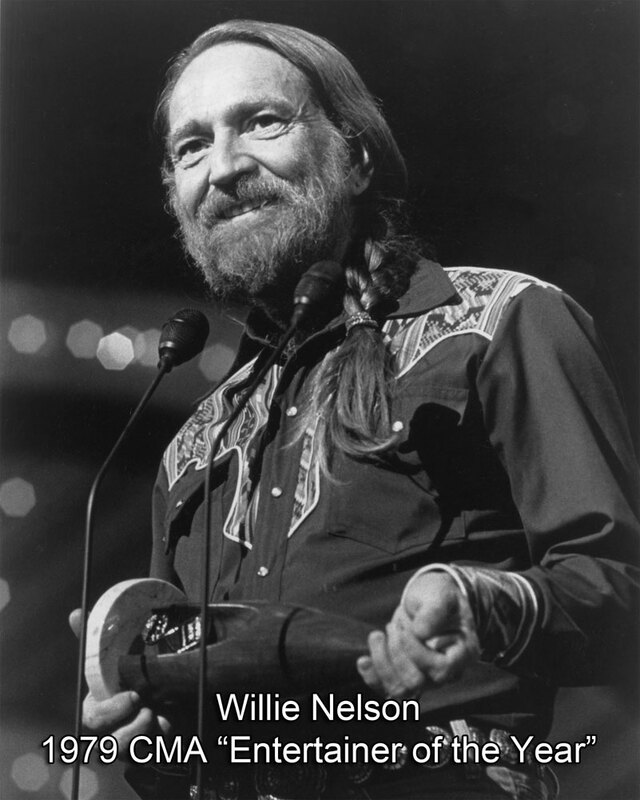 Afterwards, Willie spoke again about his heroes, country music stars from the 1950s who had a tremendous influence on the country music stars of the 1970s. If Willie Nelson had his way, they would never be forgotten. Later, he was asked if he thought he was singing with more confidence. He paused for a long time before he answered. Again, it seemed that Willie Nelson’s career couldn’t get any bigger. Even The New York Times gushed the praises of the leather-tough singer from Texas. “An objective look at the present state of Willie Nelson’s nearly three-decade-long career indicates that he not only learned form the error of his ways, but he’s in fact gone a step further and turned them all into triumphs,” wrote Willie-watcher Bob Allen in country Music Magazine in 1980. “For at least the last three years, some journalists have been predicting that his career was bound to peak any second now, and that it would all be downhill from there.